So Luana, tell us a bit about the kind of cultural activities you run here at Outrigger. Probably one of the most popular things we do here is the Hawaiian vow renewal ceremony; we offer it complimentary to our guests. Our ceremony is done in Hawaiian, there’s actually a time when they vow to each other in Hawaiian, so it kind of gets them excited about it. It has a wonderful meaning to it and we’ve been doing it for 15 years now! We have something for you to do every day, from hula lessons to lei making, Hawaiian petroglyphs, Hawaiian bracelet making and many more. This is something that we wanted to share with our visitors while they’re here on vacation. We know they want to make their way out to the beach, to tour the island, but we wanted something back here on the property to share with them. Can you tell us a bit more about the vow renewal ceremony? How wonderful is it to be able to renew your vows, here on the beach of Waikiki? We have a Hawaiian minister, we call them kahu, we have a hula dancer, a ukulele player with us on the beach. We do it very early in the morning so the beach is still empty. It’s nice and cool and our guests get to continue their day touring, laying back and enjoying the ocean. And how did that particular ceremony come about? One day I got a call from a couple. 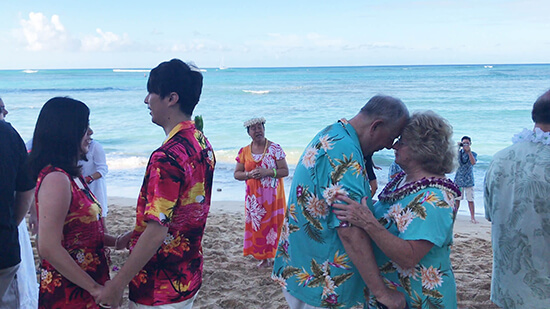 They had always wanted to come to Hawaii and now they were celebrating their 50th anniversary. They were elderly and couldn’t get around, so they wanted to see if we could do something right here so we created it so we could have it done on the beach. You’re in Hawaii – the beach is THE big thing! We talked to a Hawaiian priest and got some hula dancers together, we thought that would be a way of sharing the culture as well as celebrating the anniversary. The day that they had it done, there were so many tears in the eyes of the people who came with them, as well as people who were just passing by or standing by. It was such a special ceremony and after that point we realised that there are so many more visitors with the same kind of story. They’re finally making their way to the island, wanting to celebrate something like this. 15,000 couples have done this, and we’re looking to do more. Why is it so important for you to share the Hawaiian culture? I think people travel to the islands for the beauty and some of its the history, so I want to make sure the story that is told is true. So in our programme here at Outrigger, our stories and culture programme is based on true life and how I was raised. 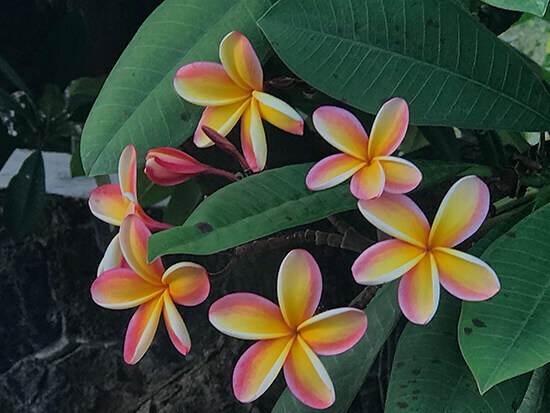 I come from a big family so there were many things that we did, from flower making to lei making, hula dancing and fishing… so why not share what comes from the heart, what came from my upbringing? And that’s what we do here – my staff, their stories all come from true life. I ask them to find that, and create that story, and share that with our visitors when they’re sitting in front of us. It makes it special, it’s touching, and to some of them [the guests] it’s something they would have never known. They know when they get to Hawaii they want to make a French flower lei, but to actually hear the story behind the lei – how was it created, why it’s important here in Hawaii to share that lei – is special. Can you share the lei story with us? The welcoming of the lei goes way back. The stories that were told in the past were all word of mouth, nothing was written, you just said ‘ok grandma or grandpa’ and they’d be your storyteller. As I mentioned I come from a large family – my dad was the eldest of 14 children, nine of them were boys, and they were invited to every girl’s birthday party. Grandma didn’t have the money to buy them gifts every weekend so she had grandpa plant flower trees around the yard. And, when they [the boys] were invited [to the parties], they knew they had to go and pick their own flowers and sew their own leis. Not only one lei, but two! One would go to the person that was being celebrated, and the other would be to the mother of the house. So when I have our visitors sitting with me, and they’re making a lei, they’re thinking about making it for the person that’s sitting beside them and sharing. It’s the love in making a lei, knowing that someone planted, picked it, sewed it, just for you. How special receiving a lei is. Tell us about the musical programme here. So the entertainers that entertain nightly are all award winners in Hawaiian music. Like the Grammys, we have the Na Hoku Hanohano – every year there’s a male vocal, female vocal, all Hawaiian traditional songs – and winners get to play here! 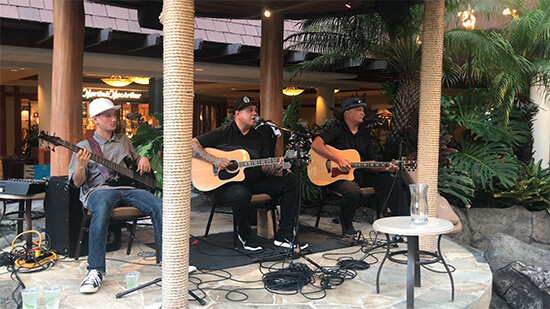 Our guests get to have the best of Hawaiian music when they’re here, nightly, and it also brings in our local community because they don’t get to see the best of Hawaiian music. We will also invite family and friends to come and join them, or recommend that, if you’re going to be in Waikiki, come to Kani Ka Pila Grille because you hear the best there. What are some of the best things to do in Waikiki? We have a programme called the ‘Waikiki Connection’. A special trolley will take our guests to nearby facilities that tourists like to go to. It stops right in front of our hotel and there are several stops along the way, like the Waikiki Aquarium, Honolulu Zoo. We have the Diamond Head Lookout which is the most famous spot to look out over Waikiki. The trolley also goes to the other end of Waikiki, into downtown Honolulu, Chinatown, where the Iolani Palace is, the Honolulu Art Museum and the Bishop Museum. Of course we also have lots of shops and restaurants here, world-famous concert halls. At the Outrigger Waikiki we have the Blue Note Showroom; it brings in artists from all over the world to entertain in a world-class facility where the sound system is just so awesome. And what are the main landmarks of the island? On Oahu we have the Pearl Harbor museum which is the most popular tourist attraction here. Great story, very heartfelt, that is a must. We have scenic spots like the Pali Lookout which is beautiful – winds blow strongly and it looks over the west side of the island. 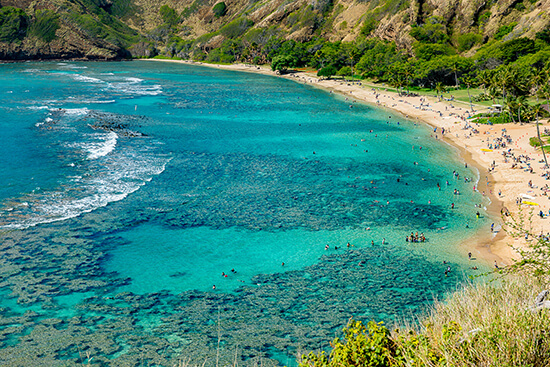 We have Hanauma Bay, which is a fish sanctuary; you can go and swim along with the fishes. And then there’s the North Shore, a favourite spot for surfing, but it’s also a beautiful drive out through the pineapple fields, past waterfalls, just countryside for the island. If one of your guests goes on a helicopter ride, what will they see? The biggest attraction for the helicopter rides, I think, is the waterfalls. It’s getting you up close to the mountains, so you can actually feel the dew of the spray as you make that turn. It’s a wonderful, wonderful tour to try. Some of these waterfalls, like Sacred Falls or Manoa Falls, you can only get to them on a helicopter tour. What do you like most about working at the Outrigger resorts? For me, being a host here, it is important for the company to make sure that the employees are happy at what they’re doing. One of the changes it made was, instead of calling us employees, we’re all called ‘hosts’. It makes a big difference. It’s like you being responsible to host an individual, anybody. And you’re not working for them but you’re taking care of them. And the minute that started the whole feeling here has changed. It made my job a lot easier and happier because I know that I’m going to take care of you like you are my guest. MY guest. That’s the uniqueness of Outrigger. We treat all our jobs as important as if we were taking care of family; that’s every day, that’s who we are. We want our visitors to know that we are here for them, we want them to feel comfortable here, we want them to come back, and bring their families with them as well. What’s good about Outrigger now is we’re international, and most of our properties are located on the beach. We know if someone is vacationing, this is what they want: to spend their time on a beach, under a tree, sipping on tropical drinks. And finally, what makes Hawaii special? Hawaii is a special place because it’s a melting pot of people. It’s the Hawaii spirit of just making everyone feel good. So matter if you’re a visitor or you live here, it doesn’t matter, when you’re here all you see is people wanting to make everyone else happy and enjoyable. Hawaii is a happy place. Want to book a Hawaii holiday? Make an appointment with one of our Travel Experts to create your tailor-made trip, or find out more about Outrigger Waikiki here. With parents in the travel industry, I was pretty much born with one of those take-off sweets in my mouth. I’m very fortunate to be close to clocking up my 50th country - not that I’ll slow down after that. No matter how many places I visit, I don’t think the excitement that comes with boarding a plane will ever wear off. Flying, for me, is one of the most extraordinary things we get to do as human beings and I’ll always be first in line for that window seat!